Well–that’s it, really. Need I say more? Actually, yes, there are a few new things to say other than to keep recommending that you see Deli Man by getting yourself a copy of it and screening it with all your favorite people who didn’t get to see it last spring. In the half a year or so since it started showing up in theaters, David “Ziggy” Gruber (the deli owner whose story anchors the film) and director Erik Greenberg Anjou have done a lot of interviews together to promote it–they did one on Fox News Radio early on, and then more recently a long, in-depth interview on YouTube with Judith Gelman Myers, film critic for Hadassah Magazine. Gruber in particular emerges in these interviews as an insightful observer on modern Jewish food and culture, its history and the history of the restaurant business as a whole. It’s an overtly intellectual and analytical side of him that wasn’t as apparent in the film. 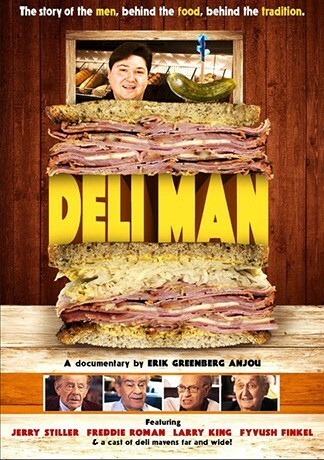 Deli Man focused primarily on his daily life, the stresses and rewards of running a deli, his sense of humor and his gift for schmoozing with his customers. To provide a national context in the documentary, Anjou filmed and cut in interviews with the owners and customers of the historic big-name New York delis, and two or three of the younger generation of deli men from Toronto and San Francisco. Much of the historical perspective and big-picture analysis he assigned to David Sax, Michael Wex, and Jane Ziegler, three prominent authors on Jewish immigrant culture. But Anjou seems to recognize that if he hadn’t divided up the roles in service to the pace and emotional/informational balance of the film, Gruber could easily have taken a seat amongst the trained historians. Like most of the other deli owners featured, Gruber is not an academic by inclination–too much personality and too little sitzfleisch. As he tells Myers, he knew from a very young age that he wanted to be a cook and from his high school grades he was not necessarily ever going to be college material. He’s underselling himself a little here (well–not in every respect; there are a few moments in the interview where he breaks out and guarantees the audience that if they try his blintzes they’ll be hooked for life, or words to that effect). But when he gets serious, which is often, the interviews bring out his head for detail and his broad-based perspective on Jewish food culture and the restaurant industry as a whole. These are things he knows a great deal about, both intellectually and as an active participant, but didn’t always get a chance to voice in the film, and which weren’t brought out by the other commentators. You’re suddenly reminded that he did intensive training at one of the best culinary schools in Europe and worked in a Michelin-starred restaurant in France for several years before coming back to the US, and he’s been keeping a keen eye on market trends, business and people ever since. So the interviews, which might otherwise have been standard pleasant-but-bland film recaps, become much more engaging and worth a listen even if you’ve already seen Deli Man. And doing them in tandem with Gruber is one of the smartest things Anjou could have done. Mom & pop stores–the little independent family-run corner grocery, hardware store, café, bakery, or barber shop–are, like local farmers’ markets, neighborhood gems just waiting to be rediscovered by a new generation. Some are the old-fashioned kind, limping along in the recession but fostering a friendly atmosphere and clientèle. Others mix old-fashioned personal service with cutting-edge specialties. Within five minutes of my house are five worth spending time in. The bike shop at the other end of my block sells and fixes everything from used kids’ bikes with training wheels (which they’ll adjust for you) to the fancy $4000-plus professional racing bikes (ditto). Around the corner, beyond the Starbuck’s, is a young-chic type all-day café with arty rectangular plates, pretty good coffee–and outlets for every patron’s laptop. Down the street is a British pub owned by the chef and his wife, with the world’s crispest, most astonishing fish & chips and dozens of artisan beers on tap. No outlets here, but you can play darts on the bar side of the pub. The coffee shop across from my daughter’s school hosts tutoring sessions and keeps a frequent customer card file for regulars as well as a shelf of books you can buy or just borrow while catching a break. And the fifth, my personal favorite, is an Armenian corner grocery with great deals, lots of unusual ingredients and spices, actual ripe tomatoes and one or another family member always willing to discuss the best way to cook something–or debate the merits of the latest Rose Parade. These businesses are always under siege from the chain restaurants and big box price cutters, which pop up and then close suddenly whenever something better comes along for the long-distance investors, undercut the locals while they’re here, and leave a trail of mistreated minimum-wage employees and other forms of exploitation in their wake. And yet often the mom & pop stores offer a better deal, unique merchandise, and certainly better service. Most important is the way local shops change the way we interact when we come in to buy something. The owners treat everyone like a neighbor or a member of their congregation (in the case of the corner grocery, they usually are). The staff are usually the sons and daughters and grandchildren of the owners. Even shy customers come in ready to say hello, ask questions, compliment the new light fixtures, complain about the state budget cuts or the new parking meters near the center of town and generally catch up on the latest. They don’t ignore or avoid the staff the way everyone does at the big box stores, and they don’t feel ignored or pestered either. Kibbitzing and schmoozing are almost lost arts everywhere else, but the better mom & pop businesses have a way of restoring that sense of belonging to neighborhood shoppers. So it’s with pleasure that I recommend two fairly recent books on the mom & pop phenomenon, with a side dish of a newly released French film.